After all these posts, many of you are probably curious about how we got started in the mushroom business. For over 30 years, there was an egg-laying operation at the farm, started by the two senior Baumlisbergers, Eugene and Irma. When they sold their quota, the two barns were empty and waiting for the next venture, to be spearheaded by Ralph. A friend of a friend was interested in using the buildings for growing mushrooms, so we looked into it and realized that it was actually a perfect fit for our existing infrastructure (storage space, coolers, trucks, packing area, and of course, the two barns) In the end, we decided to do it ourselves, and the rest, as they say, is history. We were fortunate to make a connection with a wonderful mushroom grower and wholesaler within an hour's drive of our farm, who patiently helped us get started. 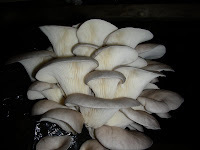 We purchased 30 large blue oyster mushroom blocks from him and harvested our very first crop within a short time. Exciting days, indeed! So different from the hens! Alot quieter, but still needing attention every day. Thank you. I think it is really nice to get a perspective on where people have been and how they got to where they are. So nice to see that someone is following this :) Our "mushroom" journey has been an interesting one indeed. We've learned so much more than just how to grow mushrooms. This sounds like a wonderful venture and adventure! Would you consider having a stall at a farmer's maket? I can supply you with wonderful details if need. Kind regards. I do participate at the Inglewood Farmer's Market from May to October..Wednesdays from 3:30 to 7 pm. There are markets in neighbouring Orangeville and Bolton, but time constraints prevent us from participating. Whereabouts is the market you had in mind? Ancaster - 3pm to 7pm Wednesdays....I see that you already have your Wednesday booked. We are probably too far for you to come to. On another note....my thought's are with Ralph's sister. Julie and Ralph are two of the hardest working people I have seen and are such an integral part of their community. We are grateful to have them in our village!